Note: Several excerpts in this column are extracted from various governmental documents including the Texas Comptroller of Public Accounts and The Montgomery County Appraisal District. All charts were produced by The Woodlands Township. You would think The Woodlands Township was taxing our residents out of their homes given all the recent rhetoric. I am constantly being called about taxes going up and how The Woodlands Township needs to do something about it. While the Township has lowered our tax rates below the effective tax rate from .3280 down to .2300 other taxing entities have kept their adopted rates above that level. The effective tax rate is a calculated rate that would provide the taxing unit with about the same amount of revenue it received in the year before on properties taxed in both years. If property values rise, the effective tax rate goes down and vice versa. What is causing the amount I pay to go up every year for my total tax bill? Appraisals! 1. An appraisal district in each county sets the value of taxable property each year. The chief appraiser is the appraisal district’s chief administrator and is responsible to a board of directors for its operation. 2. An appraisal review board (ARB) settles any disagreements between you and the appraisal district about the value of your property. 3. Local taxing units, which include the county, cities, school districts, and special districts, decide how much money they will spend each year. This, in turn, determines the tax rate they need to set and the total amount of taxes that you and your neighbors will pay. The system has four stages: valuing the taxable property, protesting the values, adopting the tax rates, and collecting the taxes. The Texas State Constitution sets out five standards for the property tax. 1. Taxation must be equal and uniform. All property must be valued and taxed in an equal and uniform manner. This provision, which is an equity standard, helps ensure that no single property or type of property pays more than its fair share of taxes. 2. 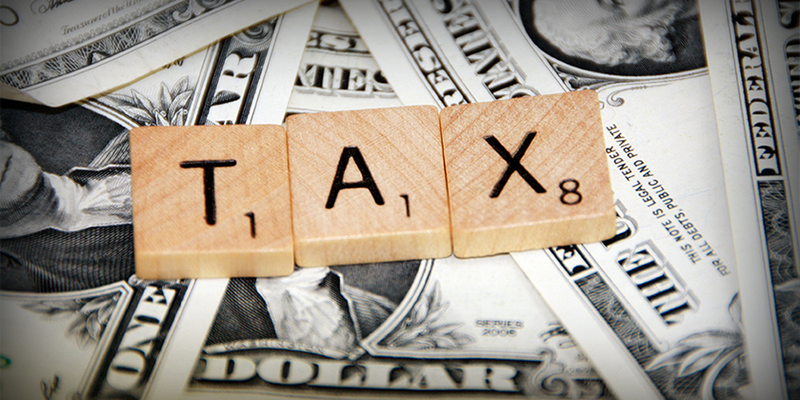 With some exceptions, all tangible property must be taxed on its January 1 market value. The exceptions include certain inventories, agricultural, timber and recreational, park, and scenic land subject to special appraisal. A property’s market value is the price for which it would sell when both buyer and seller want the best price and neither is under pressure to buy or sell. 3. All property is taxable unless federal or state law provides an exemption for it. An exemption excludes all or part of a property’s value from taxation. 4. Property owners have a right to reasonable notice of increases in appraised property values. 5. Each property in a given appraisal district must have one appraised value. An appraisal district’s boundaries follow the boundaries of the county. Is The Woodlands Township being treated in an equal and uniform manner? I believe our residents are disproportionately taxed. The Woodlands is less than 20% of the population but is bearing nearly 38% of the total tax burden within Montgomery County. Additionally, commercial and residential property owners in The Woodlands absorb an average of 41% of annual appraisal increases. The Culprit: Appraisal Increases, Not Tax Rate Increases! What has the Appraisal valuation process done to the average Woodlands homeowner over the past 5 years? The Woodlands Township tracks the annual taxable impact related to the final taxable annual appraisal increases. Over the past 5 years our average residents home has seen a cumulative 32.5% taxable appraisal value increase. 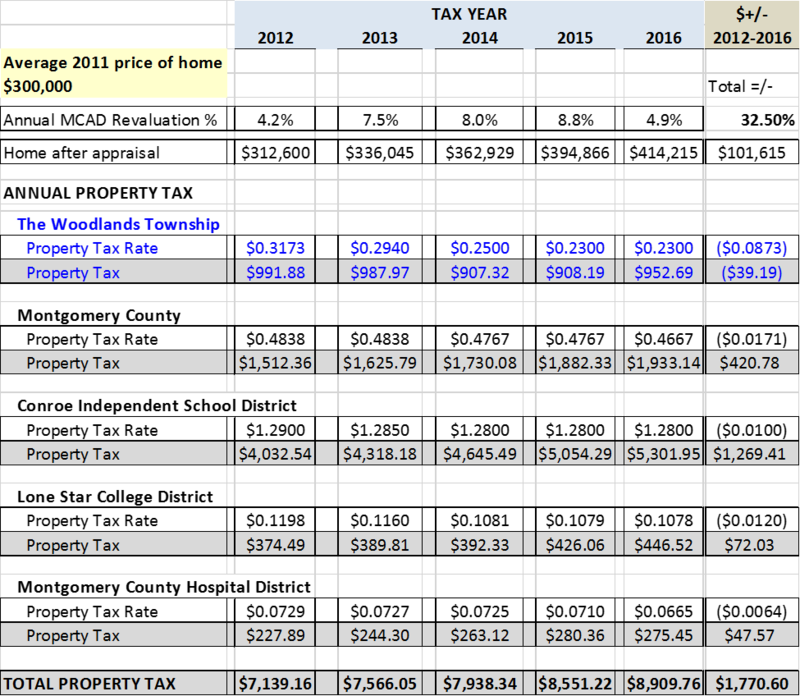 The chart below illustrates the impact to an average home over the past 5 years and the amounts each taxing entity received from your total property tax bill. The chart above also demonstrates the majority of the increases in your total tax bill have been generated not by tax rates but rather by the Montgomery County Appraisal District. That doesn’t absolve the other taxing entities from their ability to adopt lower effective tax rates but does illustrate how the check you write grows while politicians claim low tax rates. The real threat to your total tax bill is the annual appraisal process and whether or not the taxation valuations are being administered in a uniform and equal manner. 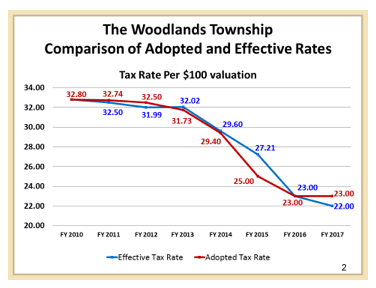 Below is The Woodlands Township analysis of our local taxes as a percentage our residents total tax bill. You will note the impact since I was elected in 2012 has dropped and the Township is the only taxing entity to reduce the tax burden to our residents. You should also note The Woodlands Township property tax represents only 10.7% of your total property tax bill. The rollback tax rate is a calculated maximum rate allowed by law without voter approval. A taxing unit's rollback tax rate is a calculated rate that divides the overall property taxes into two categories - M&O and debt service, also called interest and sinking. For all taxing units, the debt service portion of the rollback tax rate is the current year's debt payments divided by the current year's property values.12 The debt service rate may rise as high as necessary to cover debt expenses.13 I hope this article was beneficial to our community and you only need to look at your recent tax bill that should have arrived this week to verify the accuracy of the information provided.